Even in the hot summer. Once in a great while, I have to reapply, but I reapplied my old chemical containing, aluminum filled antiperspirant so, no difference there. The difference is, I still sweat. Sweat is okay. Sweating is natural. Blocking our sweat?! Not natural. I haven't tried it, but a friend of mine uses baking soda to keep dryer. Makes sense. So, keep a "deodorant only" lemon in a container in your fridge. Cut off the tip. 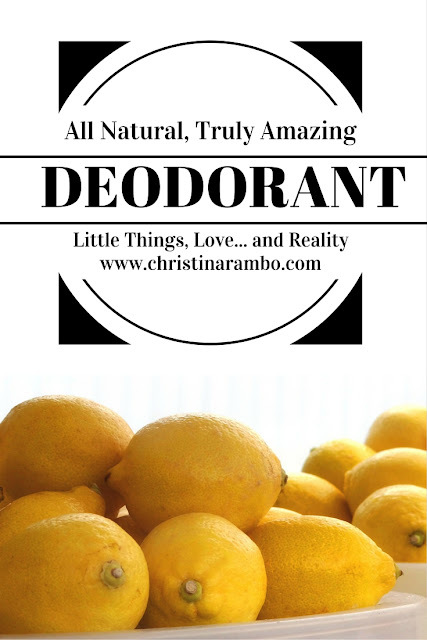 Hold the lemon just like a deodorant stick and apply the open end of the lemon to your pits. Then, cut off a tiny slice (which you discard) and put it back in the fridge for the next day. Warning: Give this at LEAST a week. I promise you won't smell unbearable, but your body will go through a slight "detox" adjustment period. I'll never go back. I love lemons! What ways do you naturally deodorize? Tell me in the comments. Let's share ideas with each other. Oh wow, that's a really neat tip, I never would have thought about it. Thank you, I'll try it sometime. I love the smell of lemons! thanks for this tip, chris. i can't wait to try it! i'm always looking for natural deodorant ideas that actually work. i've tried several to no avail yet. i tried a mix of coconut oil, baking soda, and some eo's. the baking soda ended up making a dry leathery patch on my underarm skin. same with my sister. we may just have especially sensitive skin, but i wouldn't recommend it. please keep sharing more home remedies that you have found tried & true! Does this help with underarm odor? Say yes... lol. I know part of that is hormones and a need for a detox.. but in the meantime, would love some help! Yes... absolutely. When at the end of the day I do the "sniff test" of the shirt I wore, I would describe the smell as neutral.